Death Angel was formed in the San Francisco Bay Area, California, in 1982 by cousins Rob Cavestany (lead guitar), Dennis Pepa (vocals, bass), Gus Pepa (rhythm guitar), and Andy Galeon (drums). After considering a number of different names for the band, including "Dark Fury," Cavestany and D. Pepa settled on the name "Death Angel" after coming across a book by that title in a book store. 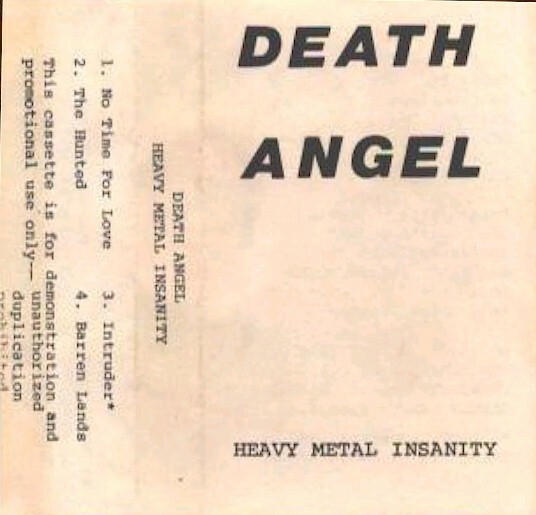 In 1983, the band released their first demo, Heavy Metal Insanity, with Matt Wallace serving as producer. According to Mark Osegueda, the group was then "more like a metal band, more like Iron Maiden, Tygers Of Pan Tang and stuff like that," as the so-called Bay Area thrash movement was only just beginning to rise to prominence at the time, and make its influence felt. Osegueda, a second cousin of the other four members who had been working as their roadie, became the group's vocalist in 1984 and performed his first show with the band on a bill with Megadeth in April of that year. Death Angel continued to play club gigs in and around the San Francisco Bay area for nearly 2 years, writing songs and refining their stage show. 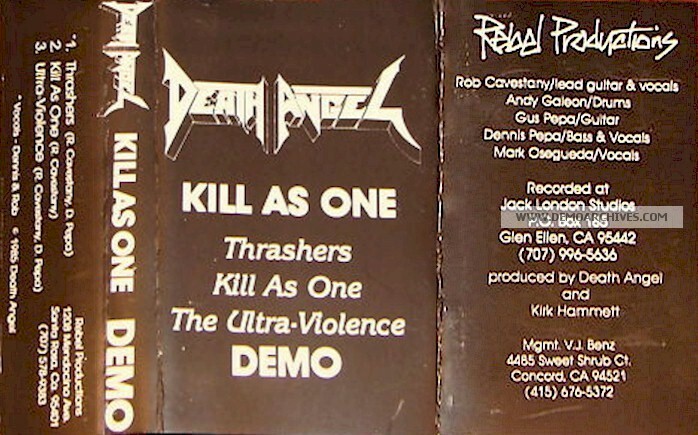 In 1986, the band recorded the Kill As One demo with Metallica's Kirk Hammett (whom they had met at a record store signing in 1983) as producer. 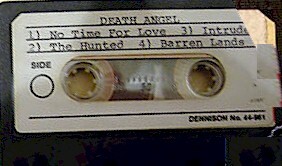 Due to the underground tape trading wave of the early 1980s, the demo was distributed extensively and brought the band to the attention of a still-wider audience; Osegueda later recalled that prior to the release of the band's first album, "we were playing in L.A. and New York, and the crowd was singing our songs, because there was this underground tape trading....That's what keeps it alive, and I think that's absolutely wonderful." 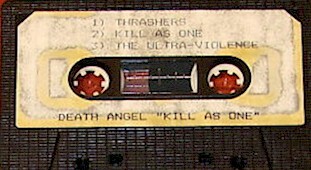 The success of Kill As One led to a record deal with Enigma Records, who released Death Angel's debut album, The Ultra-Violence, in 1987. The band recorded the album when all the band members were still under 20 years old, and the album sold 40,000 copies in just four months. Paper cover. Back has band info and recording info. Pro printed cover. Studio tapes w/ stickers on the shell.